Be informed of important facts so YOU can save a young life and keep loved ones safe. Approximately 60,000 young children are brought into emergency rooms each year because they have had access to and took medications that were left within their reach. Don’t let this happen to you or someone you love! Summer break is here. Kids are home much more and families are likely to travel. Whether you’re packing for a family vacation, going to a relatives or friends home, checking into a hotel, or hosting a house guest, it is important to safely put away medications. Especially during June, National Safety Month, the Centers for Disease Control and Prevention (CDC) is reminding parents and caregivers to practice safe medication storage no matter where they go by keeping all medications “up and away” out of sight and reach of young children. Starting June 1st, the CDC is raising awareness with their Up and Away Campaign to promote medication safety. Knowledge is power and it’s never too early to start. Feel free to download this medication safety coloring book and pass it along to children so they can begin to understand: Medicine is Not Candy. Here are some travel points that should be considered. Whenever separated from luggage, it is important to protect medication from being stolen. It is extremely common that highly addictive medications like opioids, examples of common opioids would include Hydrocodone, Codeine, OxyContin, and Methadone are stolen every day and should be better protected when traveling. Opportunities for medication access are endless. Keeping your medication in your carry-on is a great start, but what about protecting them when you get to your destination? Are medications placed in the safe or are they assessable to hotel staff, relatives, friends and curious children and teenagers? If someone did take a pill or two, would it be detected? Take the extra precaution to detect and deter others from the temptation of helping themselves to your medication. 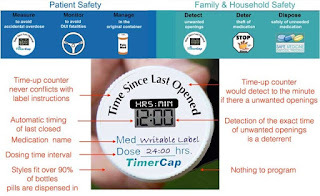 Along with the above precautions, think about adding a TimerCap on medication bottles. 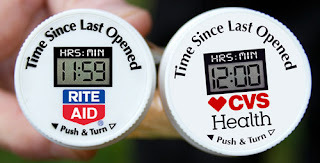 It will give automatic piece of mind knowing if someone has opened the medication container. TimerCaps resets automatically and count up. With this feature, it is easy to see when the bottle was last opened. Not only will you know if someone else helped themselves, you won’t have to remember when YOU took your last dose. It’s a twofer. For knowledge and safety go online or to your local CVS or Rite Aid pharmacy to pick up a three pack of TimerCaps today. These also make a great gift of safety to families traveling with children, young kids or teenagers.